Island Light Creative provides small businesses with efficient, effective marketing assistance so they can focus entirely on running their business. Copywriting, magazine articles, SEO, digital advertising, web design, social media marketing….if it involves creating a unique message to reach your target audience, we can do it! For overloaded marketing managers tasked with doing it all (and then some), we’ll lighten your workload with marketing assistance that will help you bolster your brand and communicate just the right message to your clients and prospects. Allowing you to focus on overseeing the big-picture strategy. As long as you have an existing site built on a user-friendly content management system (CMS) like WordPress or Joomla and have the admin access, we can help update your current site and keep the content and images fresh as an ongoing service or on an as-needed basis. Either we set up your new site and hand it off to you completely to just get you started, or, if you prefer, we will manage it for you on an on-going basis. Easily learn how to make simple updates to content or images to your new site. It’s not as difficult as you might think once you get to know the CMS and the user interface. We’ll show you how to access your new site and your hosting account. Contact Island Light Creative today to get started with an initial Needs Assessment. Once we determine what you want to accomplish, we’ll develop a set of S.M.A.R.T goals and be able to outline exactly how we can help. Every marketer faces different challenges. Although they typically share similar goals, some are bogged down with administrative tasks (busy work), hiring and retaining qualified help, events and company functions, and attending meetings, meetings and more meetings YAY!….While others are having trouble finding (or understanding) the right technology solutions to drive their strategic goals. Whatever the case may be, there’s always at least one area that any marketing manager or business development director can stand to improve. Not matter how qualified, talented and experienced you are. In other words, there’s always room to optimize the various components of your marketing strategy and justify your efforts (and budget) with concrete ROI. Hiring a full time employee to help with the duties and responsibilities described above can be time consuming and expensive. Save time and budget by outsourcing this work to us! Island Light Creative offers 10 years experience in marketing and publishing roles; we would be glad to assist you achieve your strategic marketing goals. 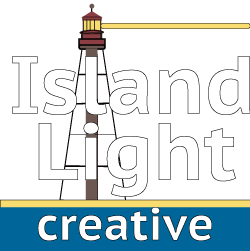 See how Island Light Creative can put our skills and experience to good use for your business. For everything from print to digital advertising, copywriting, social media marketing, SEO, web design and more, if it involves creating a unique message for reaching new customers, we can help you succeed.